We'll be discussing Jane, Unlimited by Kristin Cashore. Jane has lived an ordinary life, raised by her aunt Magnolia—an adjunct professor and deep sea photographer. Jane counted on Magnolia to make the world feel expansive and to turn life into an adventure. But Aunt Magnolia was lost a few months ago in Antarctica on one of her expeditions. Now, with no direction, a year out of high school, and obsessed with making umbrellas that look like her own dreams (but mostly just mourning her aunt), she is easily swept away by Kiran Thrash—a glamorous, capricious acquaintance who shows up and asks Jane to accompany her to a gala at her family's island mansion called Tu Reviens. Jane remembers her aunt telling her: "If anyone ever invites to you to Tu Reviens, promise me that you'll go." With nothing but a trunkful of umbrella parts to her name, Jane ventures out to the Thrash estate. Then her story takes a turn, or rather, five turns. What Jane doesn't know is that Tu Reviens will offer her choices that can ultimately determine the course of her untethered life. But at Tu Reviens, every choice comes with a reward, or a price. 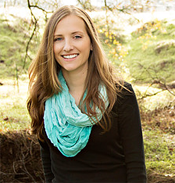 Great Beginnings YA Bookclub for adult readers is led by YA author Parker Peevyhouse. We will meet the second Thursday of every month at 7:00 pm at Hicklebee's Bookstore to discuss our featured book. Great Beginners will receive a 20% discount on titles chosen for discussion. Parker Peevyhouse is likely trying to solve a puzzle at this very moment, probably while enjoying In-N-Out fries, admiring redwood trees, and quoting movies about sentient robots. Parker's most recent novel, The Echo Room (Tor Teen 2018), is a science fiction thriller for young adults which Kirkus called "a thrilling ride" in a starred review. Stump her with your most challenging Harry Potter trivia, and ask her to recommend unusual books for all ages.